Have a little person in your life needing a Christmas present? 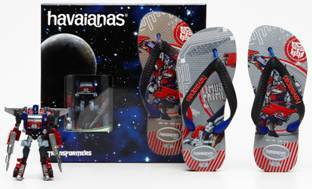 Havaianas have released their very popular My Little Pony and Transformers Havaianas with an included corresponding toy, just in time for Christmas. A pair of incredibly cool Havaianas and a matching collectible toy! And you can order online and have them delivered directly to your little person's front door. Talk about easy and with free shipping on orders over $49 rather affordable as well. Win, win win I say. Of course if My Little Pony and Transformers aren't your thing, there are plenty of other great Havaianas to choose from. With summer just around the corner a pair of good quality rubber thongs is more than a must. Oh! I like these! Great gift idea for my hubby's nephew and nieces! My girls would literally go gaga over the My Little Pony ones - very cute! Love the transformers ones...how about Star Wars? I have the transformers ones ready for my eldest, they are very cool!